August is my favorite month so far for Twelve Loaves because we are working with herbs. I love them all. I find great joy in preparing a dish and walking to my herb plant boxes in my front yard and snipping a few leaves or bunches of fresh herbs to add to my meals for the day. I guess it makes me feel nostalgic. My daughter cringes if I use the word vintage. It is a joke now with us and she points out all things vintage to me. It is true. I do feel connected to a simpler time. I enjoy old things. I find myself happiest when I have worked hard all day and then sit down to a meal that I made from scratch using ingredients that I grew. Popovers are a vintage dish to me. They use basic ingredients that we have had in our kitchens for centuries. They are an American version of the Yorkshire Pudding from England. I usually make them "as-is" but last week I decided to have some fun with them. I wanted to incorporate a fresh herb into the batter and add a bit of cheese to see if they would still be loved by my family with the extra ingredients. Isabella asked for seconds and thought they were the "bees knees". I guess they were too. Making anything gluten free from a regular recipe is challenging. I am working with some of the same ingredients but then adding new flours and starches to the mix. Sometimes it works and every once in a while it does not. This time it worked. The outside was crispy, the inside hollow and the top "popped" over the top of the pan, hence we have a great Gluten Free POPOVER! YAY. I get excited about this stuff because those that have to eat with food restrictions give up a lot of their favorite foods. It makes me happy when I can share a recipe that brings an item they miss back into their diets. 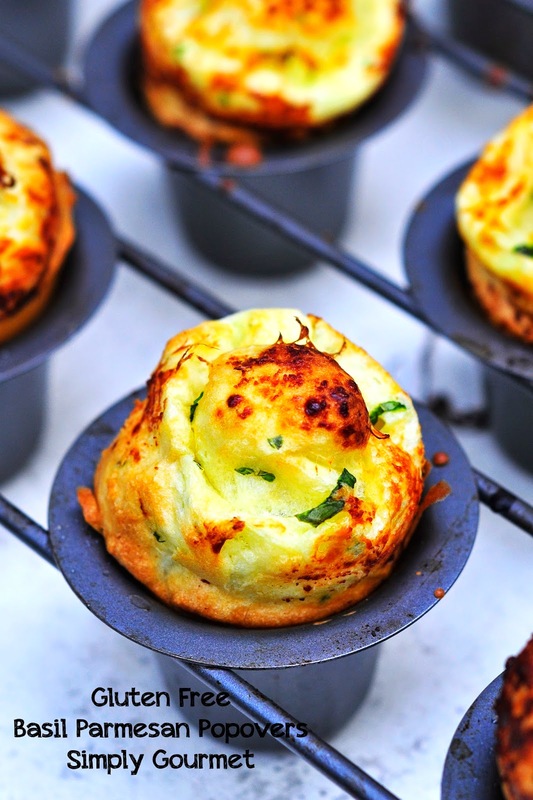 I hope that you will experiment with your own popover version mixing up the herb of choice. Try thyme, rosemary or parsley--or get crazy--and combine all three. Scroll to the bottom of this post to see my friends recipes too! We have a great selection for Twelve Loaves this month. The highlighted links will redirect you to their pages. If you need help converting a recipe to gluten free, let me know. Most recipes can use a basic all purpose gluten free flour to exchange 1:1 for the wheat based flours. NOTE: To guarantee the success of this recipe I encourage you to use the volume measurements. I have tried to get the cup measurement as close as possible but using the grams will guarantee the recipe turns out the same each time. The batter is thicker than crepe batter yet thinner than pancake batter. If the batter seems too thick, add a bit more milk. If the batter is too loose then add more rice flour. 2. In a medium bowl combine eggs and milk. In a separate bowl combine dry ingredients and whisk well. Add the two together. Whisk until the batter is smooth. 3. Mince the basil and combine with egg batter. 4. Let batter sit for 15 minutes. While batter is sitting, put a small dab of lard or butter into each popover. If you use butter, adjust time, because it may burn. My pan has 12 popovers. Put pan in oven long enough to heat pan and melt lard, about 5 minutes. 5. Take pan out of oven and ladle the batter into each popover. They should be about 3/4's of the way full. Sprinkle the batter with a dusting of parmesan cheese. 6. Return to a very hot oven and let cook18-20 minutes. Do not open the oven to keep checking on them. This may cause them to not rise or POP. 7. Remove from oven and serve immediately or let cool and refrigerate leftovers. My kids reheat them in the microwave with butter, lemon and powdered sugar. #TwelveLoaves August: Herbs If you’d like to add your bread to the collection with the Linky Tool this month, here’s what you need to do! Wow! 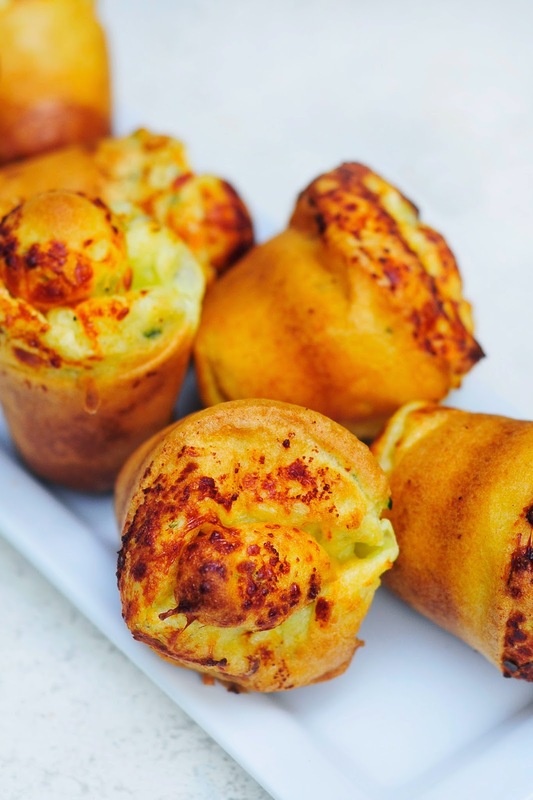 You are talented when you can make gluten-free popovers. I'm still working on regular ones. 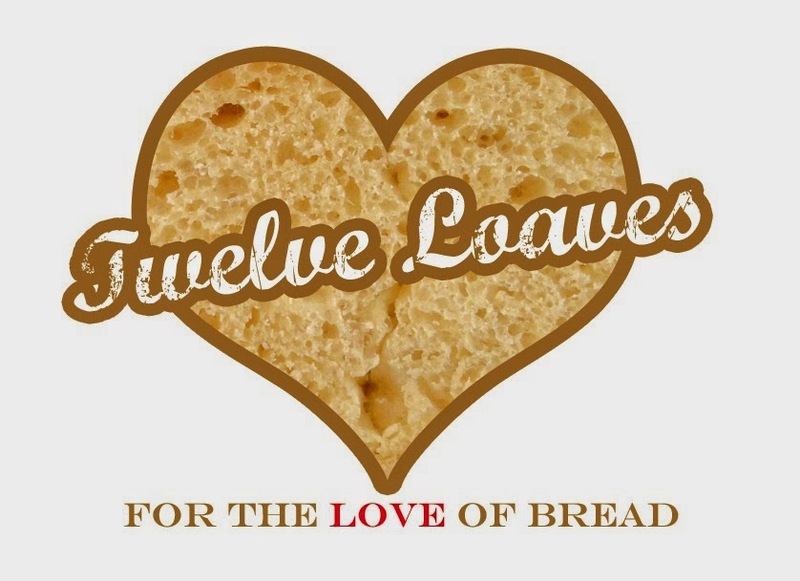 Thanks for hosting this month's Twelve Loaves - you have done a fabulous job! Tapioca and rice flour: I need to learn to you them as you do. Thank you Rossella. I think the basic combination of rice and tapioca lend themselves to a perfect combination for popovers. I have tried other flour combinations and they just don't POP like these do. Good luck. Your gluten free popovers have popped way more than any I've ever made! They are absolutely stunning, Sherron! I've shared them with a friend whose daughter is gluten free. You have MASTERED this gluten free thing! Thank you so much for hosting today. Ah, thanks Stacy. A lot of trial and error goes into gluten free baking but I am finally to the point with a few more success than failures. I hope your friend likes them. I'm going to add basil and Parm to my next popovers! How wonderful! Thanks so much for hosting this month! Thanks Liz. I can't wait to try a variety of herbs next time. I can't wait to see your version. I have never made popovers before but they're on my list of things I want to try. When I do make them, I want them to look just like yours! They're perfect!!! I too enjoy walking out to my herb garden to snip. It give me a great sense of satisfaction too. Love that it feels vintage and nostalgic to you! This was a fun read along with a great recipe! I love popovers ... and yours are downright adorable! I've done a touch of gluten-free cooking, but baking always scares me ... definitely going to try this recipe! Those are so cute!!! 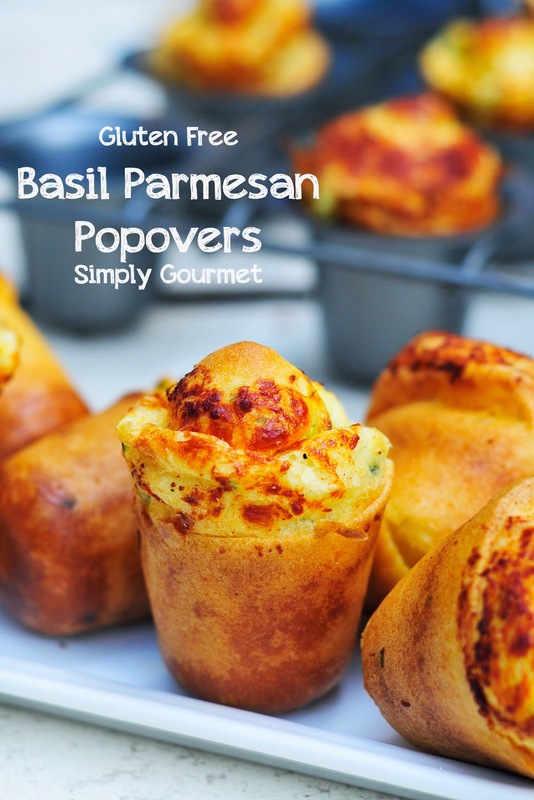 I love popovers, and the basil makes them sound even tastier. You have totally inspired me to try these! They are gorgeous! These look so beautiful, I want to reach in and grab one. Popovers always seemed like such a challenge, gluten-free ones especially. You make it look easy. I haven't done any gluten-free baking but I really do want to give these a try. Thanks for sharing this. I am not GF, but I have a good friend with Celiac. So, I am always looking at new recipes for her. LOVE #twelveloaves. 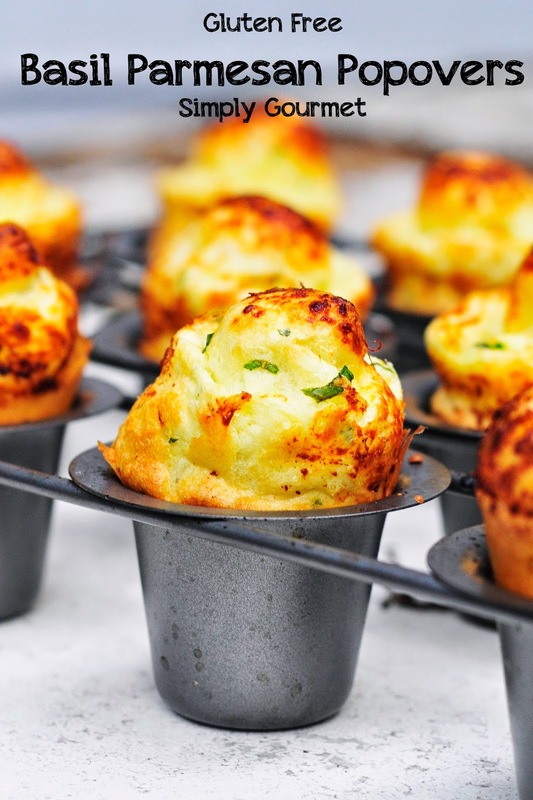 What awe-inspiring height on your popovers! I can't wait to try the recipe to share with a GF friend. Thanks for sharing. Sherron I just wanted to let you know I pinned your recipe a while ago and that pin has been repinned 1,485 times ... wow! I miss you on facebook (but I TOTALLY understand why you left) and wonder how you are doing. I hope all is well with you. Happy holidays my friend! Hi Ann.... Thank you so much for the comment and checking in. Wow that is a lot of repins too. I am doing well just super busy. Finnley is keeping me on my toes. She has felt like our busiest kid yet...lol. or maybe I am finally slowing down. I also miss my friends but I honestly don't know how I did it last year...slowing down with the blog and social media has freed up my time to do other things and I have really enjoyed my time away. I hope you are well too. Are you ready for the holidays? Thank you again for dropping in. Miss you. These look amazing! Can't wait to test them out. They'd be great for a dinner party. CAN I USE BOB MILLS GLUTEN FREE BAKING 1 TO 1 MIX INSTEAD OF THE TAPIOCA AND RICE FLOUR? I personally have not tried this but I knew many bakers who switch out brmill with good success. Goid luck. These look so tasty! What if you have flour with the gum already in there? I just bought Pillsbury flour should I just skip that step? Yes you would skip adding the gum if your flour already has this included. Thanks for the question. Could you be a little more specific about how hot the oven should be for baking these;) thank you. Hi, I have the temperature posted at 450 degrees. I find that this hot temperature works well to pop the popover. Tried making these and the recipe made 6 not twelve. Are you using mini popover pans or did I leave something out or overfill or something? Also, when I left the butter in the oven for five minutes it turned brown - is that the intent? Do you put the 2T melted butter in the batter? I do not see where you add it. Thank you. Hi, I use a normal popover pan and get 12 popovers. The pan shape and size will affect how many you get, as well as, how full you fill each one. I noticed in the recipe I had used lard in the instructions and butter in the ingredients, I am sorry about this, and have corrected the recipe. Yes, if you use butter and leave it in that long, it will brown. The lard should not. I use either in my recipes depending what I have on hand. If you decide to make them again, and I hope you do, I would recommend using less batter in each muffin space and using butter, but add it to the pan for one minute. Thank you for your question and I hope this answered your question.